These playful booties add just the right mythical touch to your baby's street style. Mermaids and minotaurs are tremendous, but when it comes to dressing your little one, nothing quite enchants an ensemble like a unicorn. With these cozy booties, your baby will go down in stroller club history with their feet adorned in fables. It's the ultimate introduction to myth and magic, all while keeping them snug and stylish. Made from 100% cotton with a polyester lining. Designed in the UK. Made in Vietnam. 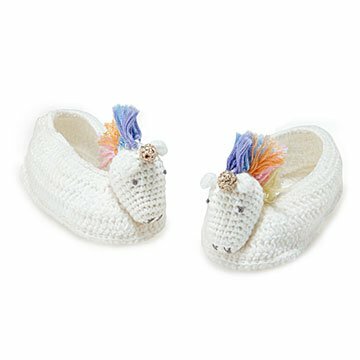 These cute white unicorn booties will go with many newborn outfits. Cutest darn booties! Well made, quality, baby gift!